All girls deserve some flowers ... either real ones or the ones you can create for yourself from the tutorials on the website. You have a good selection to help you choose the style you want. Any one of these will give you the finishing touch you may need and they are all easy to do. 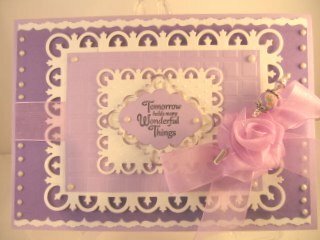 And this card uses the wonderful Spellbinders. and there are several tutorials on which ones to choose. To create mine I have used a Hot Glue Gun but if you don't have one of these then you can stitch the ribbon in place each time you roll it around. Make your stitches small so that they don't come through tp the front of the flower as that would spoil the look. Then make sure you glue the finished flower in place securely. 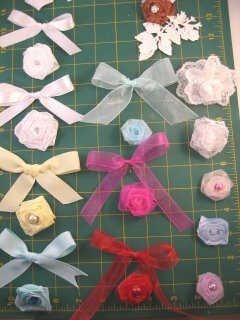 They can be made from any type of ribbon, organza, satin, seam binding, lace and even net to make your flowers. 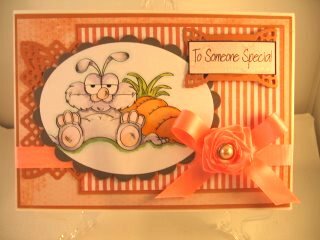 This cute rabbit is a digital stamp from Just Inklined and there is huge selection for you to browse through.